I planted my onions this week – so excited! I like to use onion starts instead of sets. Have you tried the starts? Onion sets look like little onion bulbs and I don’t know why they don’t like to grow in my vege patch. It is quite the mystery. The starts are like baby onion plants grown from seed over the winter months and then made to go dormant through refrigeration until I buy them and plant them up. The starts are definitely harder to come by but I saw some being advertised at one of my fav gardening stores, Renfrow Hardware in Matthews, so off I went to pick some up. They come in bundles of about 75 little plants and look like this. Details of the farm where the onion starts started – Bragg Farms, Georgia. 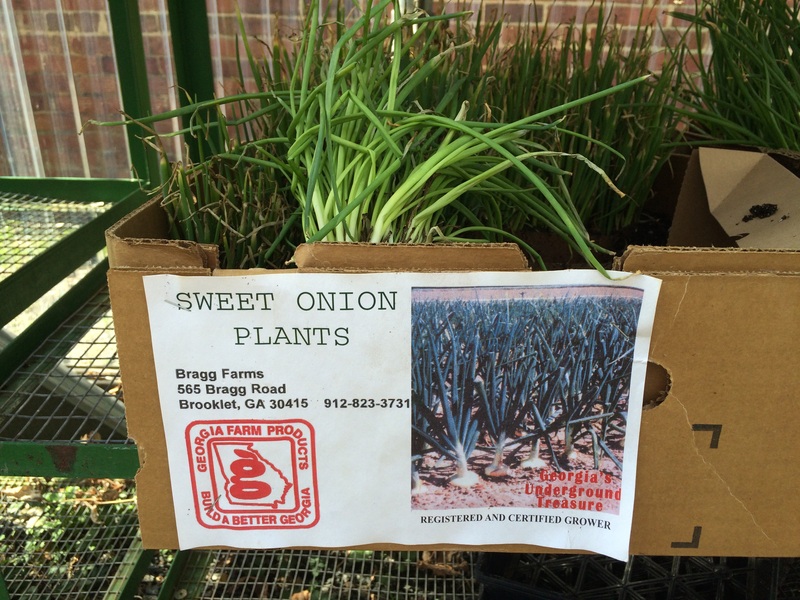 …but when I got home I couldn’t find anything about ‘sweet onions’, so I decided to call the actual farm where the plants grew and find out what they were. See the name, address and phone number right there on the box? Bragg Farms, Georgia. I was kinda nervous though. I mean, who calls random strangers to ask about the onions they bought retail many states away? But I needn’t have worried as a lovely lady named Lou answered the phone at Bragg Farms and we had a lovely chat. Now, Lou is a lady who knows about onions. She gave me all kinds of information that I am going to pass on here. Ready? Firstly, Lou told me they are a variety called “Sweet Harvest”, and then she asked me if I knew how to plant the onions. Ahhhh, sure… I think so… How hard can it be? But instead of being cheeky I asked her to tell me how she likes to plant her onions. And you know what? I’d been doing it wrong all this time which is probably why my onions have been such a failure! There is actually far more to planting onions than I ever imagined. What the wha??!! I know. Here’s what she said. If you want onion-onions, like bulb onions that are round and you cut up to saute with carrots and celery, you only plant the starts 1/4″ in the ground. 1/4″ – no more! They will look like this, all falling over like they should be buried more deeply, I know I know. See how they protrude out of the ground and almost sit on top? That’s what they are supposed to look like. 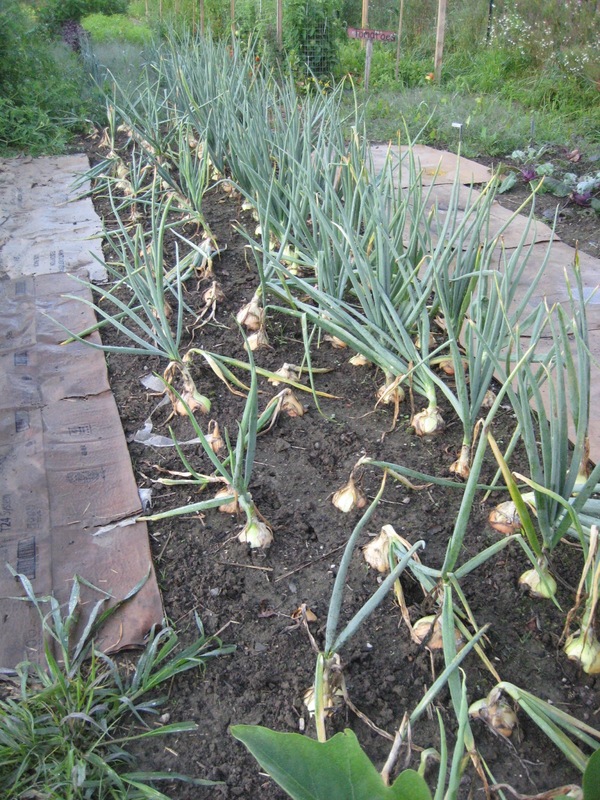 The onions will be ready to harvest once most of the leaves have died back and turned brown. If you want green onions, like spring onions that you use to sprinkle on the top of chicken and sweet corn soup, you plant the same starts 2-3″ in the ground. See, all the red parts are buried underground? Same plant, very different planting techniques depending on what you want to grow. A-HA! Such a lightbulb moment for me. No doubt I’d planted last years’ onions far too deeply and I grew lots of beautiful spring onions thinking I was waiting for onion-onions to form. Lesson learned. I use the Square Foot Gardening planting technique so I went out and planted 3 squares of onions (16 per square) and 1 square of spring onions (36 per square). I’ll be very happy if I can get 48 bulb onions and 36 spring onions out of my 4 sq ft of garden space. Awesome! Lou also recommended using Miracle Grow on them once a week as onions are heavy feeders and “…you can never over-fertilize onions.” Now, I’m not a fan of MG and other synthetic fertilizers as I’d rather just use my own homemade compost but, in the interests of full disclosure, I am passing on all of what Lou told me. And that’s what she said. Do you grow onions? Did you know about the different planting techniques for the different kinds of onions? ← Proliferate Poppies – from 5000 to 200,000! Wow! I think I have starts instead of sets and I never knew they needed to be so shallow. Tomorrow I’ll see if I can replant some of them to get the bulbs I’ve always wanted. Thanks! Very interesting stuff from Lou! I’ve seen onion bulbs growing on top like that but have never tried it (although I’ve never had trouble getting bulbs from deeper planting). I think I have another experiment to try this year! I wonder if it depends on the variety? What variety do you plant? Starts or sets? So many questions. Hmmm, will be interesting to see the results of the different planting techniques. Could be. I plant either, but usually sets.